In a medium mixing bowl or Kitchen Aid add flour, sugar, baking powder, baking soda and salt. Beat the eggs with the buttermilk and melted butter. Combine the dry and wet ingredients into a lumpy batter, being careful not to over mix. Heat a couple of teaspoons of butter in a skillet over medium heat. Spoon 1/3 cup of batter into the skillet. Cook for 2 to 3 minutes per side. 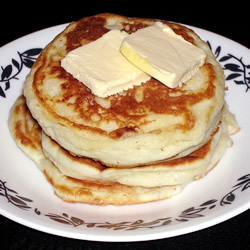 When bubbles start to rise to the surface of the pancake and the bottom edges are lightly golden then it time for a flip. Note: When you see the bubbles and are going to flip the pancake, then is the time to drop you favorite berries onto the pancake. Once you have added the berries you can flip them then. Be sure to use fresh or thawed berries. If you use frozen berries your pancakes will take longer to cook and sometimes will still be a bit raw inside.